We have finally reached the point in the story when I get my hearing aids! As you can imagine, it was a long journey up until this point. 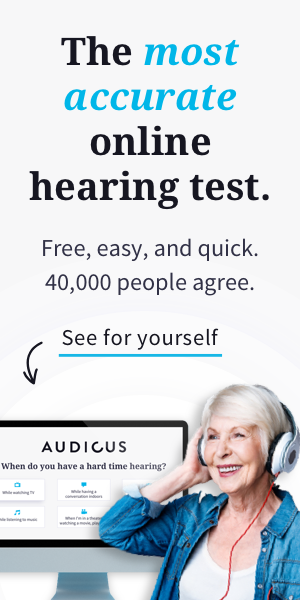 Even though symptoms of my hearing loss surfaced in my adolescence, I wasn’t diagnosed until college and I didn’t decide to buy hearing aids until more than a year after my initial diagnosis. So, in the summer of 2009, my audiologist Geraldine presented me with my first pair. I had sixty days to test them out. I tried them on in her office, and she made adjustments so that they were fitted to my specific loss and needs. She set up different programs, which I rotated through with a button, that were appropriate for different environments. For example, one program blocked out background noise and magnified foreground noise for use in crowded restaurants or events; another was slightly quieter, for use at home. Geraldine explained that it would take some time to get used to wearing the hearing aids, and that it might be overwhelming at first to get used to hearing a much greater variety of sounds than I was accustomed to. In fact, when I first tried them on, I heard lots of strange, unfamiliar sounds that made me think that the aids weren’t working right. Buzzing, humming, and whirring all came in loud and clear. But Geraldine said that was normal and that these were the sounds of the air conditioning, the ventilation system, and the fabric of my clothes as they shifted against my chair. For the next few days and weeks, I tried to get used to the new hearing aids in a variety of different situations. In one anecdote which I retold for years afterward, I got used to them in a bar in Vermont. I had just turned 21 and was visiting my college campus with friends. I was a bit nervous about wearing my new hearing aids out, because I didn’t want anything to happen to them. But I was also very excited to go out and be able to hear all of my friends, even in a loud setting like a bar. So we headed out to a popular local bar with a dance floor and a live band. After dancing with my friends for an hour or so, I reached up to touch my ear, and my right hearing aid was gone! I started panicking. It must have fallen off while I was dancing. But how could I find it in a dark, crowded bar? Without thinking twice, I dropped down on my hands and knees, and started feeling around blindly for the tiny hearing aid. My friends asked what was going on and started looking, too. One of them went back to search the couches where we had sat down earlier. Shortly thereafter, though, I found the missing hearing aid on the arm of the sofa where we had been seated earlier in the night. I don’t think I’ve ever breathed a sigh of relief quite as big!